When Bon Appetit first started supplying catering on construction sites, it wasn’t law for hard hats to be worn. 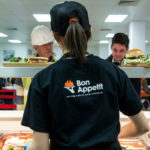 Much has changed since then and Bon Appetit has evolved to become one of the leading and most well respected food service providers in the UK. If you want security, stability, efficiency, longevity and confidence in a main contractor then look no further. Bon Appetit was founded in 1969. Over the last five decades we have worked with some of the most demanding companies and complex, high profile projects including, more recently, the London 2012 Olympic Games, One Hyde Park and Terminal One extension at Heathrow Airport. Far removed from a low budget start-up, Bon Appetit has been around the block! We have survived and thrived in the economic storm, so you can be assured we will be there for the duration of your project. Each and every one of our dishes is freshly prepared from the nest ingredients that are locally sourced, wherever possible. 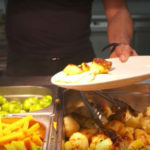 Don’t underestimate the contribution of an experienced catering partner – good food makes for a happy workforce. Bon Appetit excels at designing food service areas for large gatherings that minimise queuing and use the latest technology to speed up service to your workforce. It is our innovative approach to logistically-complex developments that underpins our success at winning large-scale projects. You will enjoy a direct relationship with our hands-on decision makers, Tony, Robert and Paolo Manzi to ensure that your project runs smoothly at all times. We will also support you by utilising government schemes to employ apprentices and local people. We will train them to help ensure you hit your targets and keep local councils on side. We use as many local suppliers as possible so the wider community benefits from your project too. We believe we are the best solution on all of these fronts, so what remains is price. There is always a cheaper option available but there are obvious downsides to taking this route. By awarding Bon Appetit the contract you can forget about the catering side of your project. Leave that in our capable, trusted hands, while you concentrate on everything else.